When one goes to a capital city it is now, for most, a sadly antique tradition to go first to the Cathedral. America is peculiar in the sense that it does not elevate the Church above the state—making them more or less equal in importance. 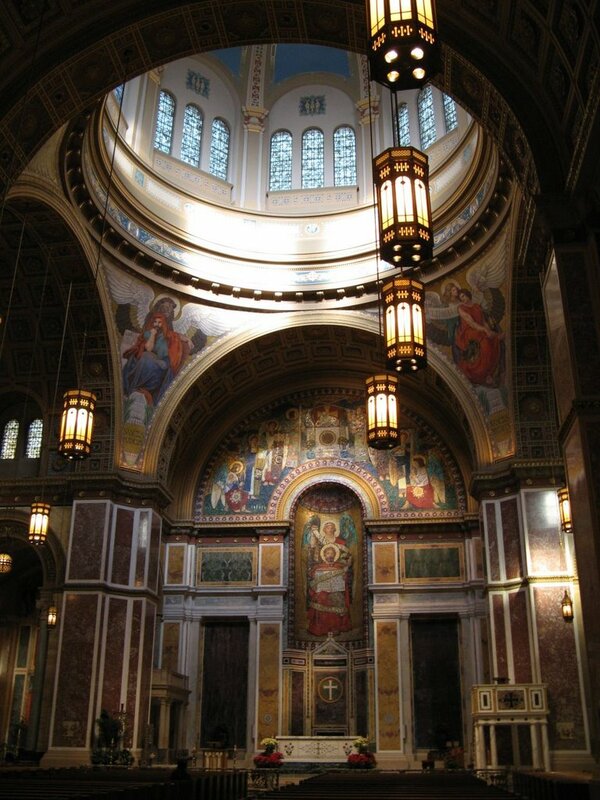 At Washington, The Cathedral of Saint Matthew the Apostle is located on Rhode Island Avenue at 18th Street in, central city, in much the same way as the Cathedrals of Old Europe. What is startling about Saint Matthews is that it is, on the outside, at best undistinguished and at worst just plain ugly-looking for all the world as a building forever caked in dust. St Matthew’s is officially described as being a red brick building of Romanesque and Byzantine design. If it is, such exterior design ought to be outlawed altogether. Ah, but inside, peace and beauty and serenity unsurpassed! The Church also appears small compared to the European and Latin Cathedrals in cities of similar importance. But once inside, one is enveloped in peace and quiet and a faint sense of incense in the air. For many people At Washington, this peace and quiet is perhaps the only readily available respite from the harried grind of the business day. The marble work in the nave, side chapels and main altar, all magnificent, serves well to prepare one for the dome—an angelic, crowning art work concentrating mainly on the four Apostles. It is not hyperbolic to think of Michael Angelo and his Sistine Chapel when looking up at this masterpiece. To simply sit for a bit and look around, and in your serenity, to think of the paucity of the outside world to put one at peace is a blessing despite one’s religious convictions. While Americans have always formally considered that Church is for God and political conflagration is for mortals, the two rarely meeting, Saint Matthews is a bit different and as such has both local and national political significance. All this is offered to show that politics and religion are very much intertwined to this day. Politicians are always reminded by senior aides that America is at least 26% nominally Catholic—meaning that figure represents those who were baptized into the Church. As such, it is not antique at all to write first of the Church when writing of American politics. Go to Saint Matthews for an hour and sit in the sweet silence there among wafts of incense and old memories and for that time forget about the modern world and its chaos for a brief period of reflection and solitude.